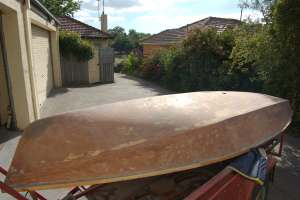 Well after several ear splitting days the boat has been completely sanded back to either wood or fibreglass. 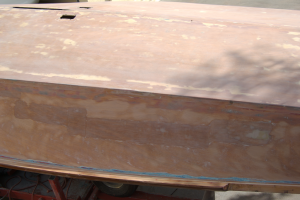 When the fibreglass was laid on the bottom of the boat the original paint had not been completely removed, so a deep burgundy color and white shows through in places. For the record the bottom of the boat had 4 coats of paint, a black automotive paint, then a red paint, a light blue and finally a white paint. On the side of the boat there were 6 coats of paint! 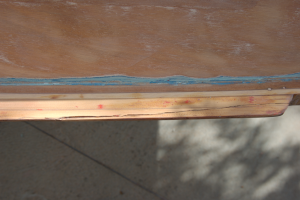 Two different coats of red paint on the side, then a light blue that matched the underside, white, then a deeper blue and white again. I am not sure how much weight this saved, but there was a lot of effort to remove the paint. Once the paint was removed the ‘scars’ of the boat shows through. It is interesting to note that both of these ‘injuries’ on the boat are on the starboard side, suggesting that someone didn’t give way to starboard tackers. 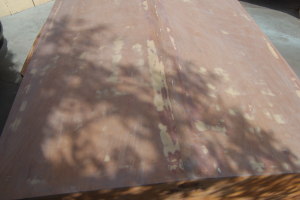 A crack in the starboard gunwale was my fault. 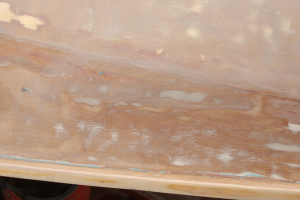 Cracked on the decking when getting into the boat. 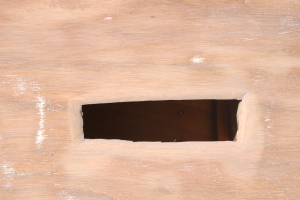 Finally the hole in the side of the boat was cut out and will be replaced with a new piece of plywood. 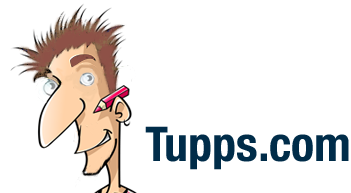 Once everything was removed from the stern of the boat, it was obvious that a couple of ‘problems’ had been covered up. 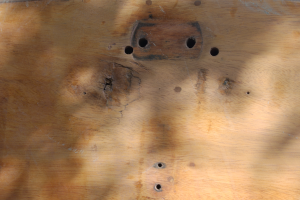 You can’t see it from the photo but the pintels had pushed the plywood in, and then the wingnut on the rudder had hit holes on either side. 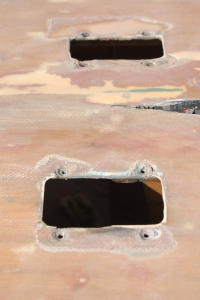 It looks like I either have a choice or replacing the whole back panel, or patch the holes with filler and paint the back of the boat. I have decided to patch and paint the back of the boat. One last thing on the boat was the self bailers hadn’t been removed when the bottom was fibreglassed. This wouldn’t have been a problem if the screws where epoxied tight, unfortunately 6 of the screws turned, and couldn’t be removed with out digging through the fibreglass. End of the day I now have to patch the bailer holes and will re-drill the holes later on.